Technology firms wowed us in 2011, delivering tablets, ultrathin laptops, innovative cloud services, and voice command digital assistants. Not so long ago, the technology underlying these products was nothing more than research and development projects. So, in an effort to peek into our not-so-distant tech future, here's a glimpse at ten promising projects percolating in tech research labs. I’ll take you behind the scenes at Microsoft, IBM, and university labs where researchers are experimenting with a range of fascinating technology that may appear in future consumer products. Look forward to 3D images you can "touch," touchscreens that get sticky, robotic astronauts, and -- yes -- even flying cars. Scientists at Microsoft Research, a global R&D arm of Microsoft with 300 researchers and engineers, are working on a project called HoloDesk that lets your hands interact with three-dimensional virtual objects. The device uses an overhanging screen to project a 2D image through a beam splitter into the viewing area. A user's hands and face are tracked via Microsoft’s Xbox Kinect technology and a webcam, to help keep the holographic illusion in sync with the user's physical spatial relationship to the viewing area. Named after the fictional simulated reality facility on the TV show Star Trek: The Next Generation, Microsoft’s version of the HoloDesk is designed to deliver holographic-based board games, remote collaboration tools, and advances in telepresence. You can check out more details in the video. Another Microsoft Research project called PocketTouch is being developed with the goal of enabling users to manipulate a touch device through clothing and other materials. The idea with PockTouch is that you could use finger gestures to control the cell phone in your pants pocket. With a flick of a finger, you could send a call to voice mail, skip a song playing on the phone, or send canned text replies to inbound messages. PocketTouch technology uses a capacitive sensor mounted on the back of your touch device that Microsoft says lets you navigate your pocketed phone using gestures without ever having to remove it from its case. PocketTouch is currently in an early development phase, and, as you can see from the video, it is not yet user friendly. Another Microsoft Research project, Vermeer, centers around 3D images that respond to touch. Vermeer uses two facing parabolic mirrors to create a glasses-free 3D image that you can touch. In Microsoft's demonstration video, Vermeer projects an image of a person that moves when "touched" by a finger. Microsoft says it creates Vermeer using 2880 images per second with a refresh rate of 15 frames per second. And just like the HoloDesk, Vermeer also uses a Kinect camera to track the user's fingertips as they interact with the virtual image. The most famous research project of 2011 is IBM's Watson, a super computer designed to use artificial intelligence to play the TV game show Jeopardy by processing natural language queries. After thrashing its human opponents on television in February, Watson was routed to more practical applications. Now, Watson provides its artificial intelligence to help doctors decide on optimal treatments for cancer patients. Watson parses data comparing symptoms with cures, and finds the most effective treatment for individuals. What’s next for Watson? IBM is turning Watson’s attention to the business world where the technology is being used to conduct real-time analytics for financial institutions and also to spot fraud within large bureaucracies. Researchers at the University of British Columbia in Vancouver are working on a new kind of haptic feedback for touchscreens. Programmable friction uses small mechanical discs to make the display of a tablet or smartphone vibrate so that it feels more or less "sticky" depending on how you are interacting with objects on the screen, according to a report in NewScientist. One practical use of this technology could be moving folders around a desktop using touch. Friction on the screen increases when you hover over a folder to make it an easier touch target, and the screen oscillates when you hover over a trash bin as a kind of warning that you're about to discard a file. Enhancing Physicality in Touch Interaction with Programmable Friction from Vincent Levesque on Vimeo. 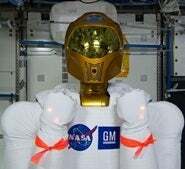 NASA and General Motors are working on a humanoid robot designed to help astronauts carry out their tasks in space. The current iteration, Robonaut 2 (or R2), is a 300-pound bucket of bolts made to resemble a human torso. R2 can lift up to 20 pounds and its arms have similar mobility to a human being's. The NASA/GM prototype left Earth in February to take up permanent residence at the International Space Station. R2 successfully moved aboard the ISS for the first time on October 13 and has since undergone tests on November 4 and December 15. You can follow R2's progress in space via Twitter and Facebook. GM hopes to adapt research from R2 including advancements in controls, sensors, and vision technology into future vehicle safety systems. The Defense Advanced Research Projects Agency is reportedly looking at "feasible designs" from AAI Corporation and Lockheed Martin for the agency's Transformer (TX) flying Humvee project, according to Aviation Week. The project's goal is to create a dual-purpose military vehicle that can fly and also drive along a road. 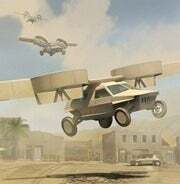 The flying Humvee must be able to seat four, survive small arms fire, and rapidly convert into an aircraft that does not require a qualified pilot to operate. Rumor has it, DARPA is also working on getting pigs to fly. Intel in September was showing off a low-power processor that is efficient enough to run a PC powered by a solar cell the size of a postage stamp. Codenamed Claremont, the chip is only an experimental CPU and Intel currently has no plans to release it as a commercial project. The company may adapt some of Claremont's technology for future products as part of Intel's goal to reduce by fivefold the power consumption of current processors. Sharp and Japanese broadcaster NHK are working on a high-definition resolution display called Super Hi-Vision that is 16 times the resolution of current full HD 1080p (1920 by 1080) panels. SHV resolution is 7820-by-4320 and each frame of film is equal to a 33-megapixel image. Sharp in May produced an 85-inch Super Hi-Vision LCD display to demonstrate the technology. Super Hi-Vision is set to begin limited trials in Japan in 2020. Massachusetts-based Boston Dynamics is helping DARPA and the U.S. Marine Corps develop an all-terrain robot dog that can help soldiers carry heavy loads in remote locations such as the mountains of Afghanistan. The goal is for the company's LS3-Legged Squad Support Systems project to produce a robot that can carry up to 400 pounds across 20 miles or more of rough terrain. It will also be powered by an internal combustion engine with enough power to last 24 hours. The company's current prototype, AlphaDog, can regain its balance should it fall or be knocked over. The end product won't require remote control and will be able to use computer sensors and GPS to follow a leader. AlphaDog can't walk without help yet, but Boston Dynamic plans to produce the first independent version of the robot in 2012.